Free boat ramp to hotel or RV park registered guests. All others $10 fee per bot per day, ramp and daily marina usage. $10 per person per day, fee to fish off docks. Please pay these fees at the hotel convenience store. Ask the Hotel/Store clerk about our Yearly Boat Launch pass for $160.00 per calendar year. 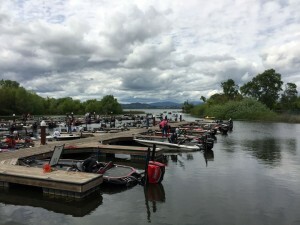 All Bass tournaments holding weigh-ins at the marina are required to contact the Konocti Vista Casino Marketing Department in advance of their tournament dates to be but on the marina schedule! Weigh ins are not allowed on the wooden docks. CA Fish and Game does NOT contact us in any way to make reservations for tournaments. This must be done by each individual tournament director. Call 707.262.1900 x1112. The Konocti Vista Casino marina is located on beautiful, historic Clear Lake in Northern California; it has 90 boat slips with electrical power outlets at each slip. There is on-the-water premium boat gas pump and easy access to the convenience store for boaters. The marina nestles into a private cove with a short channel providing easy access to Clear Lake. The marina is quiet and sheltered from the wave action on the lake. The excellent boat ramp is free for hotel/RV guests. There is plenty of room for parking boat trailers and the convenience of the casino, restaurant and full bar for exciting entertainment, food and drinks. The marina is host to many top bass fishing tournaments each year and has become a haven for bass anglers and water sports enthusiasts. The Quagga screening station at Konocti Vista Casino is available through the hotel and convenience store. For more information, go to http://www.nomussels.com.